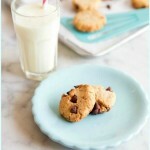 Chocolate chip paleo cookie that are grain free. Place the dates in a food processor and pulse for 30 seconds to break them up. Add the almond flour, coconut, egg, maple syrup, salt, vanilla, and cinnamon and pulse for 1 minute to combine. With a spoon, mix in the chocolate chips. Shape a large spoonful into a 2-inch ball and place it on the prepared baking sheet. With a cup, flatten the ball to ½ inch thick. Repeat with the rest of the dough. Bake for 10 to 12 minutes, or until golden brown. Remove from the oven and let cool on a rack before serving. Store leftovers in an airtight container at room temperature for 3 to 5 days.